Ever since I used a pre-production Olympus PEN-F, at the beginning of the year, I was enamored with the camera. I wrote a super detailed review of the PEN-F, and as you can tell from the review, I liked the camera tremendously. It was tough to give it back to Olympus. Well, after nearly a year of thought, I decided to buy one. My PEN-F just arrived and I took it out for a spin yesterday, for the first time. So why another Olympus? There are so many fine cameras out there. I could have certainly opted for Sony’s excellent A7 series or the Fujifilm’s X series. Ultimately, for me, it’s a matter of price / performance and size / performance. Coupled with the large collection of available micro 4/3 lenses, many of which I already own, it’s hard to move to another system. If I need a larger sensor to get higher ISO performance or shallower depth of field, I can always use my Canon 6D. Though, I’ve discovered that I rarely use it, since the Olympus cameras meet my needs so well. Their small size works well for travel, street and everyday, “shoot the family” photography. That’s the kind of shooting I mostly do. Ultimately, though, I just love how the PEN-F looks and works in hand. It’s the nicest looking and feeling camera, this side of a Lecia. But, unlike a Leica, which can be a very trying and frustrating camera, the PEN-F performs effortlessly. I also love the film like presets for the Tri-X like black and white and the saturated Chrome look, all available and changeable at the twist of the front knob. 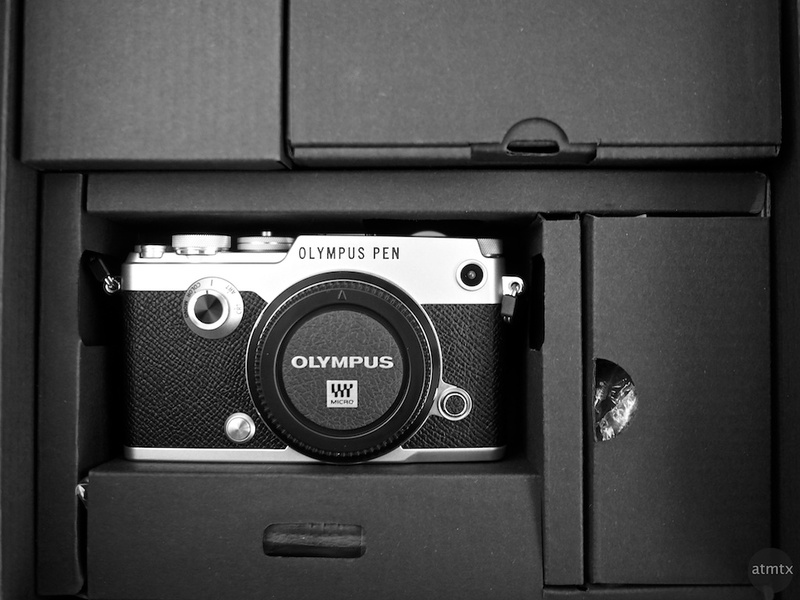 So now that I have my own PEN-F, I’ll let you know how it compares with the Olympus OM-D E-M5 Mark II. I’ll be using both cameras together. The controls are similar enough that switching between the two won’t be tough. Though I did notice a few differences which tripped me up yesterday. Just minor adjustments to make before feeling completely comfortable with the camera. I also got a couple of new lenses too, which I’ll certainly talk about in future posts. Don’t worry though. I still plan to use my other non-Olympus cameras. That’s part of the fun collecting different cameras and blogging about them. Hi Andy, I’m sure you will enjoy your Pen F as much as I do. I ordered one the minute they were available and have had mine since February, love it! It’s the camera I waited five years for Olympus to make. Other camera manufacturers had the rangefinder style with a built in EVF but I’m a dyed in the wool Olympus fan and waited patiently, finally I was rewarded. I still marvel at the design, it’s a classic. Enjoy! I’m glad you like it so much and it’s working of you. The camera does feel so nice to shoot. I have no doubt that the price will drop over time. You can already get refurbished ones cheaper. It’s a matter of patience, which perhaps, I didn’t have enough of. I have to be patient. I can’t afford it at full price. And the PL8 is out now, too. Lots of Olympuses to choose from! The PL8 is a cute and stylish camera. Yes. It is cute and stylish but I already have the PL5 & PL6. I don’t see something sufficiently different about the 7 or 8 to make me want to buy one. I wouldn’t mind getting the newer version of the OM-D E-M5. They’ll probably have version III out before I can afford Version II. I’ve been happy with the E-M5 II. Not as cool as the PEN-F but a more capable camera in some ways.